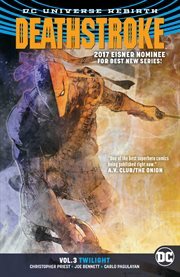 The item Deathstroke, Volume 3, issue 12-18, Twilight, Christopher Priest, writer ; Larry Hama, breakdowns ; Joe Bennett, Carlo Pagulayan, Roberto J. Viacava, pencillers ; Mark Morales, Norm Rapmund, Jason Paz, Sean Parsons, inkers ; Jeromy Cox, colorists ; Willie Schubert, letterer ; Bill Sienkiewicz, collection cover artist, (electronic resource) represents a specific, individual, material embodiment of a distinct intellectual or artistic creation found in Kent District Library. Has the sun set on the world's deadliest assassin? It's Slade Wilson like you've never seen him before, brought to his lowest point and forced to face the last two people in the world he wants to fight: his own children, Joseph and Rose! Slade can kill anyone he sets his eye on...even though one eye is all he has. But when Slade finds himself completely blind, he faces a choice he's never had to make before: adapt or die! With the help of genius teen hero Power Girl, Slade is making some changes, including an all-new identity. But when Power Girl enlists Slade's help to stop another assassin, can Deathstroke really become the hero Power Girl thinks he is? Critically acclaimed writer Christopher Priest (JLA, Black Panther) along with collaborators Joe Bennett (RED HOOD/ARSENAL), Carlo Pagulayan (CONVERGENCE) and Larry Hama (G.I. Joe) continue the critically acclaimed rebirth of the DC Universe's deadliest killer!